The markets finished up for the week. See previous updates for analysis. Next week we need to see a hold of the 20 (orange line). We formed a doji, looks like a green cross, (see candlesticks in trade professor) on the 20 to close the week last Friday. 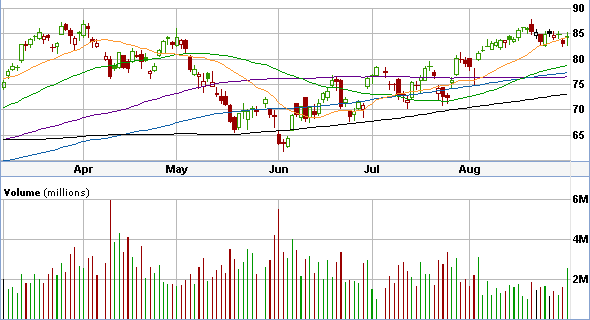 This is a bearish sign of indecision by investors but by closing above the 20, one has to be liking his chances. If you are trading short term put the stop loss below the 20 (below friday’s low of the green doji). We are going long term but are hedged in just in case we fall with an S&P 500 short etf. Previous story China- Next Shoe to Drop?